Amatrol’s Mold Design Learning System (94-DFM3) covers the most challenging application of CAD/CAM software and CNC machines, as well as one of the most important because so many parts are made from plastics. This industrial mold design training system will show how to design molds for the major plastics operations like injection molding, blow molding, and extrusion and how CAD/CAM software can be used to create a CNC program that will make the mold. A typical injection mold will create thousands of plastics parts so learning how to create a correctly designed mold that will continuously make quality parts and be easy to use in an invaluable skill. 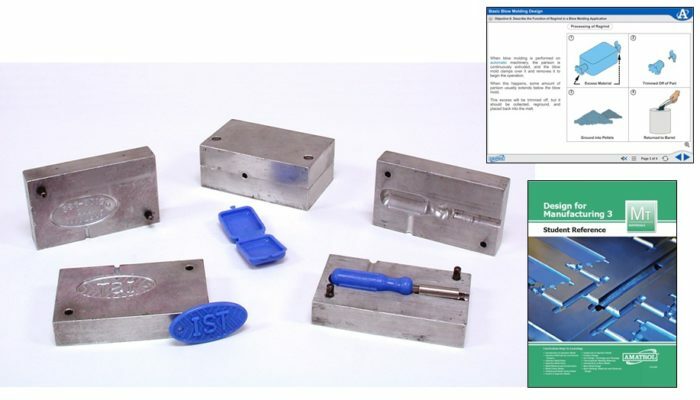 This hands-on plastics mold training system allows learners to practice skills like: design an injection mold using CAD/CAM software; determine runner sizes for an unbalanced multi-cavity mold; design a plastics part and mold based on shrinkage and warpage considerations; and create a blow mold using a CNC machine. In addition to hands-on equipment, this system features world-class plastics mold design training course curriculum covering major topics like injection mold design, part design, material selectrion, and blow molding design. Within these topics learners will study: the functions of seven basic components of an injection mold; how a vent size is determined for an injection mold; the functions of primary runners, secondary runners, and tertiary runners; how to design undercuts into a mold; material shrinkage and how it influences mold design; and common materials used in the blow molding process. This curriculum is also available in a stunning multimedia version that utilizes text, audio, interactions, and stunning 3D animations to fully engage learners. A sample copy of the Mold Design Student Reference Guide is also included with the system for your evaluation. Sourced from the system’s multimedia curriculum, the Student Reference Guide takes the entire series’ technical content contained in the learning objectives and combines them into one perfect-bound book. Student Reference Guides supplement this course by providing a condensed, inexpensive reference tool that learners will find invaluable once they finish their training making it the perfect course takeaway.